Ian and Alex arrived shortly afterwards, their host also having a weekly routine to get back into, and we had an hour to spare before our train so went for one last wander into town, taking in the theatre building. We made it back to the station with time to spare and made the platform to discover that our train was running behind schedule. Again we didn’t know where to put the bikes but, again, the SNCB staff were extremely helpful and efficient and we got all the stuff onboard without a problem. Why SNCB reserves its scabbiest trains for cross-border service I have no idea but this one, unlike the modern, efficient, unit on which we’d travelled the previous week seemed to be related to BR’s slam-door stock from the 1950s, with the added benefit of vinyl seating. It was also about the only graffiti’d train we saw all week. 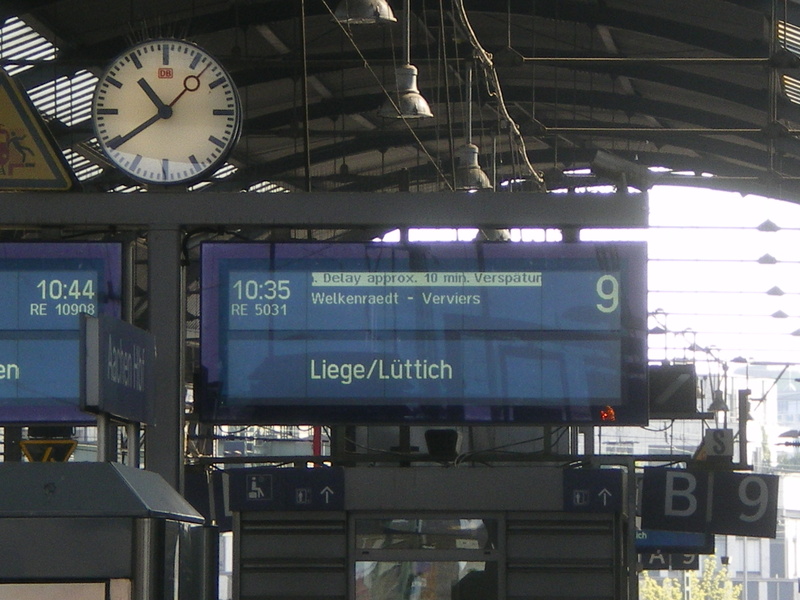 We changed trains at Liège and were pleased to see that we had the same conductor as on Thursday’s outward journey, although how pleased she was to see us I can’t say. 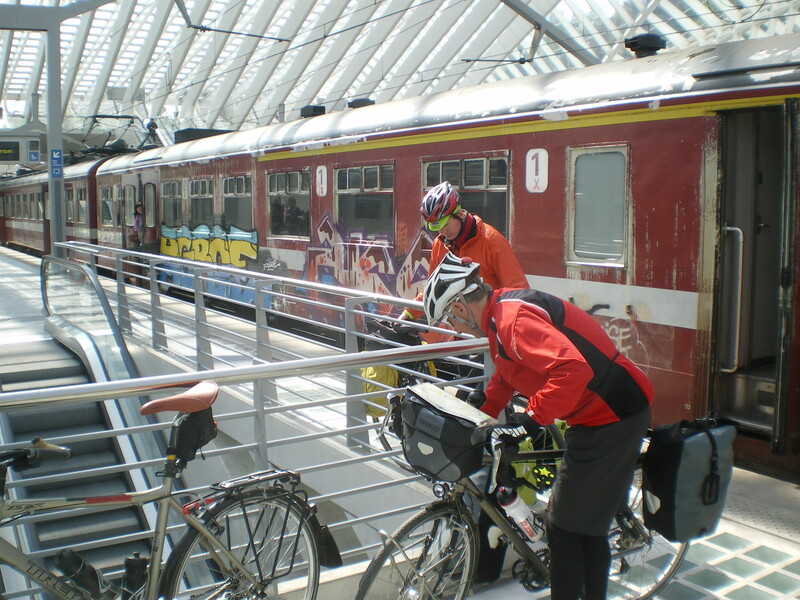 She did seem to cheer up when we told her we weren’t getting off until Oostende – the end of the line. 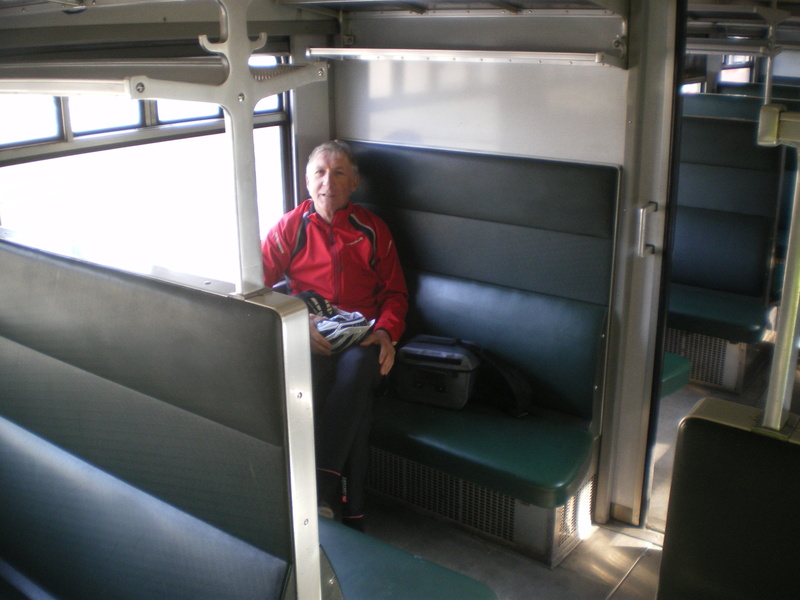 This rail journey was quieter than last week’s and some more senior members of the group even found time to snooze. 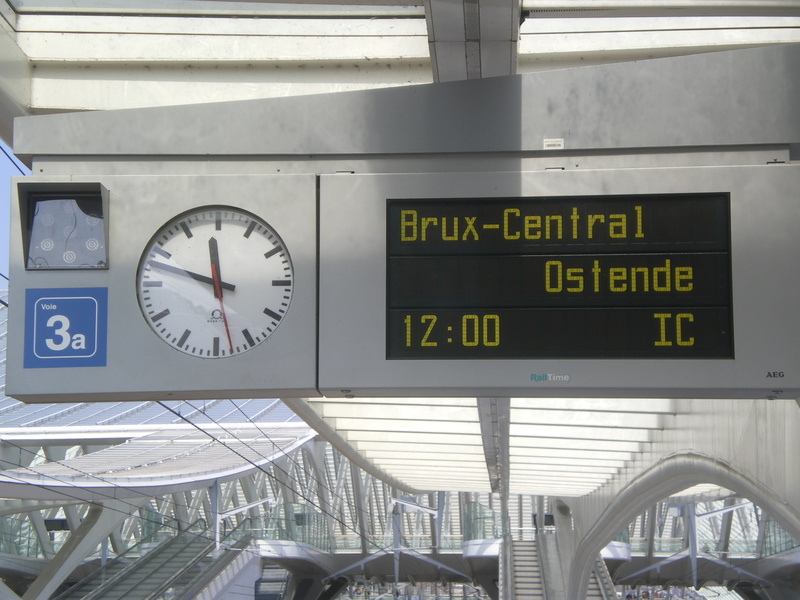 From Oostende, the plan was to follow the knooppunt network – similar to the German node network – to navigate back to the French border. We failed, totally, to find the first of our knooppunts but, having found a sign for the second, we broke for lunch. We were even able to bring our bikes into the fenced-off al fresco dining area to keep an eye on them at the Adriatic-themed restaurant we chose. through the town. Interesting, what you learn from the locals. 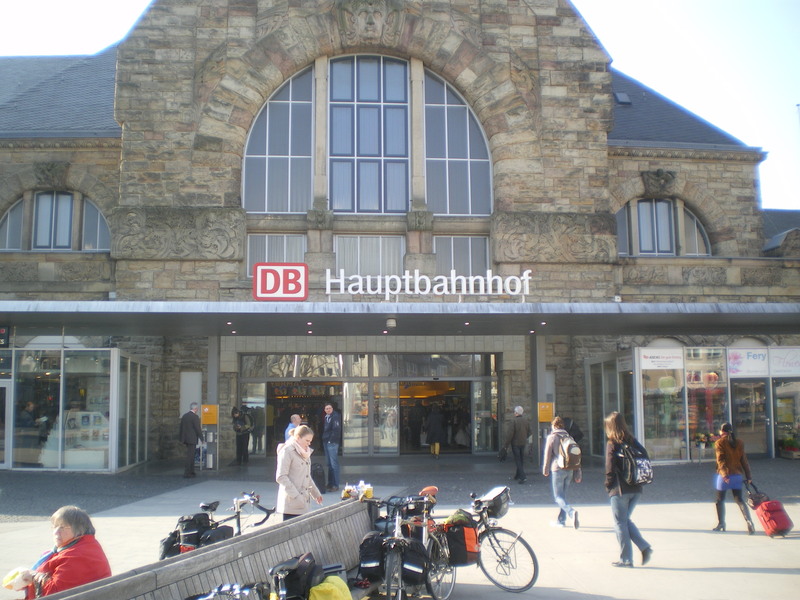 The day’s first navigation mistake came at the end of the network, when someone (no names!) misread the map and made straight over a junction instead of turning right. There followed a serene few miles of road which dead-ended at a No Trespassing sign. Oops. After a brief discussion over the possible courses of action, we made France. 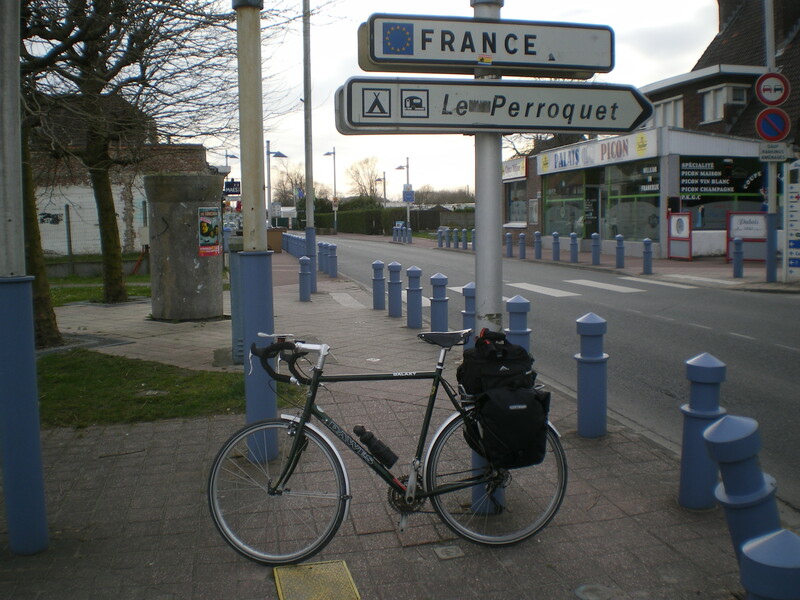 We crossed the French border at the spot photographed in Day 1’s blog and continued our way into Dunkerque, where navigation mistake no. 2 happened. Alex had already turned off to head to his night’s accommodation when we unexpectedly found ouselves in the town square, which hadn’t been on the route plan! After a quick discussion with some locals, we were headed the right way. Some short time later Ian found himself distraught at the discovery that right next door to our hotel was an ever cheaper one. Quelle horreur! (I should mention here that we’d paid under £10 each for the hotel room so I’ve no idea what a Formule1 charges). The Endomondo route for our ride from Ostend to Dunkirk is here – 37 miles. What followed is probably the best short ride I’ve had in years. There was no food to be had in the immediate vicinity of the hotel, a Buffalo Grill some 15 minutes ride away being the recommendation of the reception staff, so we called up Alex, who also hadn’t eaten, he came over and we set off, at speed, in the dark, throught the silent streets of a foreign town in search of our dinner. After a couple of miles we spotted a pizza parlour and made their day by ordering two of the largest pizzas I’ve ever seen, and four cans of Fanta. Gourmet dining on the very last evening of the visit! Suitably refreshed, we retraced our route, rolled the bikes into the room (for the management had had the foresight to install us in a ground floor unit) and settled down for the night. 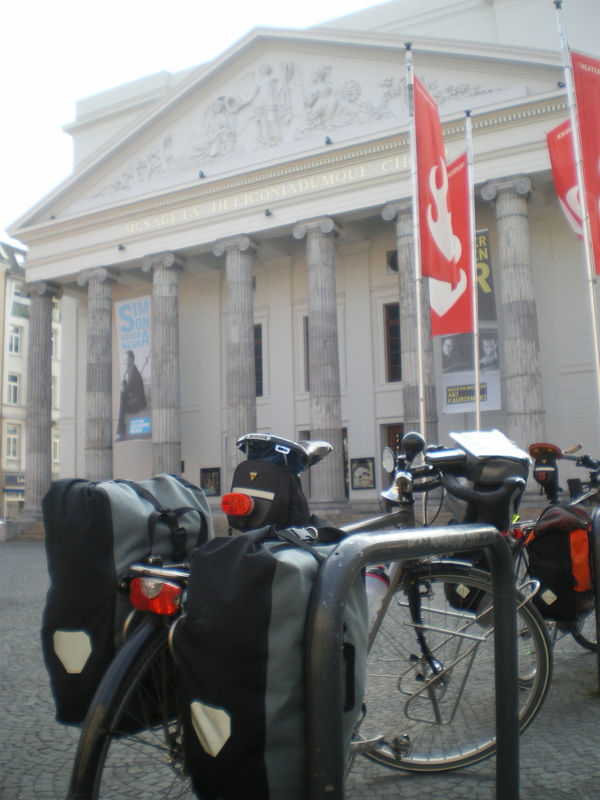 This entry was posted in ADFC, ADFC Aachen, CTC Northampton, CTC Tour to Aachen, cycling and tagged Aachen, CTC, Northampton by ianmac55. Bookmark the permalink.